South African based SharePoint consultancy and software development company, Complexus (Pty) Ltd, commences global launch of Outcome Manager for SharePoint to help the Enterprise assess change readiness, outcome risk and business capability maturity using the collaborative power of the SharePoint platform and the simplicity of the SharePoint App model. We set out to develop a solution that could prevent change program failure from happening, even before the project starts. As business leaders embark on Enterprise and systems transformation the pressure for these projects to succeed and for investments to show a positive ROI increases year on year. With 70% of major change implementations yielding sub-optimized results and the average time taken to develop mature business capabilities exceeding 5+ years, how can the transformational CIO / PMO of today deliver a successful change program, on a finite budget in an ever more complex information & collaboration landscape, whilst still demonstrating tangible improvements to the business have been attained? “This is the exact question we set out to answer with Outcome Manager”, said Nick Bradshaw, co-founder & Managing Partner at Complexus. “The speed and volume of technology based change in today’s digital Enterprise is faster and larger than ever before and practitioners need more agile collaboration tools that transcend silo based spreadsheet analysis and protracted paper based assessments. According to the 2014 PMI Pulse report, organizational change continues to be a challenge for the vast majority of businesses, with only one in five organizations reporting highly effective change management. So we set out to develop a solution that could prevent change program failure from happening, even before the project starts, SharePoint and the SharePoint App model provided us with the ideal platform, and thus the idea for Outcome manager was born. We realized we were really onto something big during the research & beta trial phase in 2014, when we conducted the now famously named “Change Challenge”. "These results were a real eye opener to us and we knew we could help our clients benefit from this kind of analysis using easily deployable SharePoint Apps" said Marc Lenferna, Co-founder at Complexus and Director of Consulting Services. "Most major companies around the world use SharePoint with ever growing numbers adopting SharePoint Online provided via a cost effective Office 365 subscription. Essentially the collaboration platform we plug into is already in place and the Outcome Manager Apps deploy straight into it, which makes it easy for the practitioner get to grips with what has traditionally been an expensive, protracted and disparate activity”. 1) ReadinessPoint - Are we ready for this change? 2) RiskPoint - will we achieve the desired outcome? 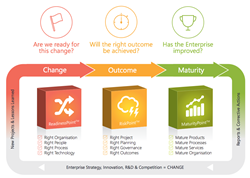 3) MaturityPoint - Has this change improved our business capability? As we took the products to market Gareth Jane, Start-Up Technical Strategy Lead at Microsoft BizSpark South Africa, gave us a ringing endorsement by saying”; “These are the best SharePoint Apps we have seen launched to date in the African SharePoint Market and we were so impressed with their work we invited Complexus to join the Program as SharePoint mentors to Microsoft BizSpark South Africa community members”. Bradshaw concluded, "We can now offer our clients these best practice Apps via the convenience of the Microsoft Office Store, as the SharePoint App model makes it easy to trial, purchase and deploy new Enterprise functionality for a fraction of the cost of traditionally built custom Apps. With zero training end users can gain dashboard based insights, audit reports and corrective actions within hours of deployment that help steer major change programs towards success in a highly cost effective manner". All three Apps are available today via the Microsoft Office Store on a free, per user & site licence basis. The Apps work on-premises or via SharePoint Online (O365) and are responsive & mobile friendly. If you are CxO, PMO Leader, ICT Manager, Continuous Improvement or Change Practitioner contact us today to discuss how we can help you get to grips with your change programs and help you achieve successful project outcomes more often, more consistently and with a higher ROI. Complexus will be showcasing Outcome Manager via webinars and various events in South Africa & Europe in 2015 including the Southern Africa Knowledge Management Summit in JHB in May 26th-28th and the CIO Road Map in JHB June 24th. Complexus is a Microsoft Gold SharePoint consultancy operating out of Cape Town & Johannesburg. In less than 3 years, Complexus has grown to become a SharePoint solutions provider with a reputation for innovation in the Enterprise Collaboration Strategy Advisory & SharePoint App market. The Complexus service & App portfolio is aimed at organizations seeking to collaborate more effectively and gain a greater return on their investment in the Microsoft SharePoint platform. Complexus offers clients configurable solutions that integrate with SharePoint allied to turnkey consulting and training solutions. Complexus works with a mix of industry partners and is a member of the prestigious Microsoft Business Critical SharePoint Partner Program.